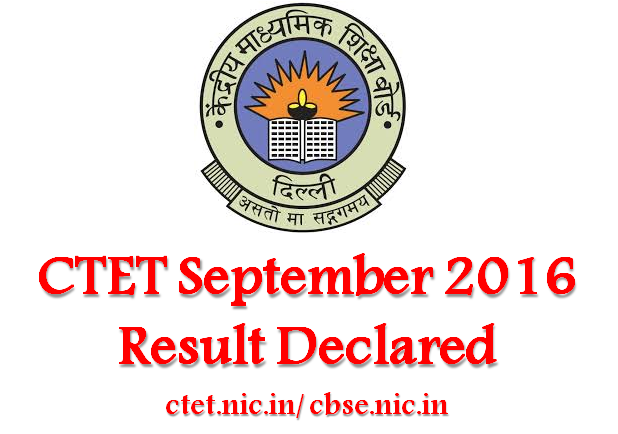 CBSE has declared CTET September result 2016 at cbse.nic.in and ctet.nic.in. Candidates who have appeared for the examination can check their result and rest can prepare for the forthcoming CTET. Central Board of Secondary Education (CBSE) the examination conducting body of Central Teacher Eligibility Test / CTET has finally declared the result online. The exam was held on 18 September. Candidates are advised to collect their exam roll number before moving towards the result portal. Exam roll number can be found from the admit card. How to check CTET September result 2016? The mark sheet of all the candidates who have appeared and certificate of those candidates who have qualified will be dispatched by CBSE shortly. Candidates should note that the saved copy of the result can be used for reference purpose only. In no case should candidates use it as a substitute or as the original of official document. CTET September result 2016 can be obtained from the link given below. Candidates should take proper care while submitting the details. Taking the response of examinees into consideration many fraudulent and spam links are buzzing around online. Therefore candidate should be very careful with the website and should only trust authentic sources. Candidate should not reveal sensitive information on other websites for the sake of getting the CTET result quickly. Due to huge number of result expectants, it is obvious that technical issues may arise. Therefore candidates are advised to wait for sometime and retry again instead of browsing through other links. About CTET Exam 2016: Central Teacher Eligibility Test (CTET, as known commonly) is held twice a year by the Central Board of Secondary Education (CBSE). The exam is held with the sole purpose of selecting eligible candidates for recruitment as teachers in primary and secondary level.